What Happens if you enter a Wrong Password on MasterCard Secure Code Screen ? Let us assume that you do a typographical error while entering your password. The System will not decline and cancel the entire transaction but it will show an error message “Invalid Password. Please Try Again”. [See Screen Shot Below]So upon entering the right password, your transaction will be authorized and then you will be taken to the merchant website confirming the success of your order. Thanks to the bank for taking an extra step to protect the interests of its customers. 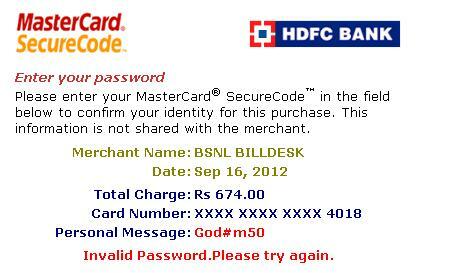 This entry was posted on Friday, November 14th, 2008 at 7:31 am	and is filed under HDFC Credit Card.